Ever since Walt Disney World opened in 1971 Disney has worked very hard to keep guests immersed in the park and resort experiences, with as little intrusion from the outside world as possible. An announcement late last week, however, shows that the boundaries of Walt Disney World’s appreciation of what guests want and need is expanding. Last Thursday it was announced on the Disney Parks Blog that the last ten cards of the Sorcerers of the Magic Kingdom set, cards not seen since the playtesting days of the game, would final be seeing the light of day. In order to obtain these spells and utilize them against the likes of Hades, Ursula, Scar, and the ilk, guests are going to have to purchase the seven card expansion packs coming to the park this month. Each seven card booster pack will include one super-rare card, which is great news, but the real story is the play at home board game that will also come with the packs. One of four game boards will be included in the packages, and will include instructions for how to play at home. These rules for play outside of the Magic Kingdom have been a long time coming. Many players and collectors have speculated since the game’s inception that the various type of attacks, boosts, and shields, and the number powers assigned to these various fields would eventually be a part of a play away from the park element. Since the game share elements with a variety of collectible card games, it only makes sense for these attack and defense pieces to be incorporated, but it would be very difficult to use these features during gameplay in the park when Sorcerers of the Magic Kingdom is tailored as a fast paced game for the whole family. 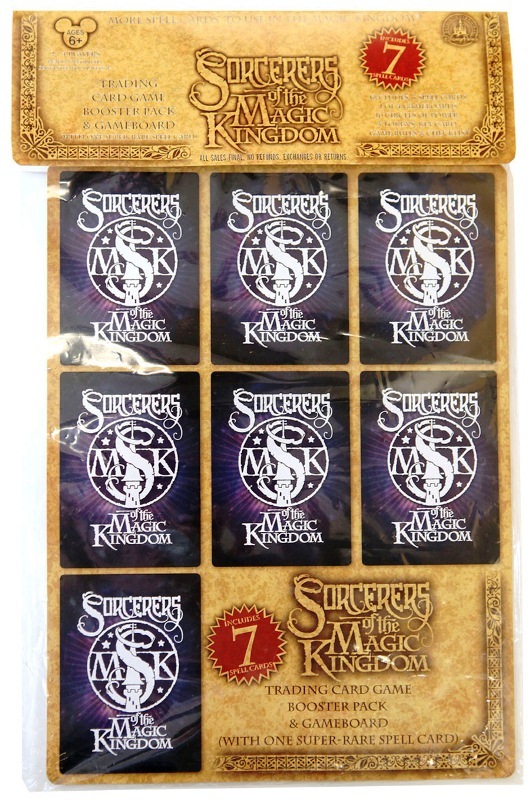 I’m really looking forward to picking up some of these packs, although I may have to wait until they make their way to the Disney Store to order them, and exploring the rules of the sorcerer battle royale. I imagine each player will still be mostly battling against the villain on the given board, but there may be a race element, a la Trouble or Candyland, to see which sorcerer in your family can bash the villain first. The other option, typical to collectible card games, is to go toe to toe with another sorcerer in your family, though this seems unlikely. My thought behind this is that Disney will still want to make this as easy for everyone in the family to play. With the ten super-rare cards finally seeing the light of day and gameplay expanding into the home arena, the longevity of Sorcerers of the Magic Kingdom is only beginning to be exposed. I would suspect to see expansion card sets and additional game boards to be rolled out in the next couple of years for those who wish to hone their sorcery skills at home. Back in the Magic Kingdom, I can only imagine more portals, perhaps even in more parks, with new villains and challenges to face off against!